Hello my friends, Once again I risked life and limb to head out to fill the bird feeder. OK... so that's a huge exaggeration. It truly was all I could do to lift my feet through the huge amount of snow from the garage to the where the feeder hangs. The cardinals must have sent out an SOS to all of their friends and family, the ground is covered with their beauty. tells us it's March 1, with the snow flurries floating in the air I'm beginning to wonder if 'Ole Phil was correct with his forecast of an early Spring. Flurries for us can mean a foot or just that flurries. I took off first thing this a.m. for the store to pick up a couple of prescriptions. I did not want to stand in a line of 25 people tonight after I close the shop. 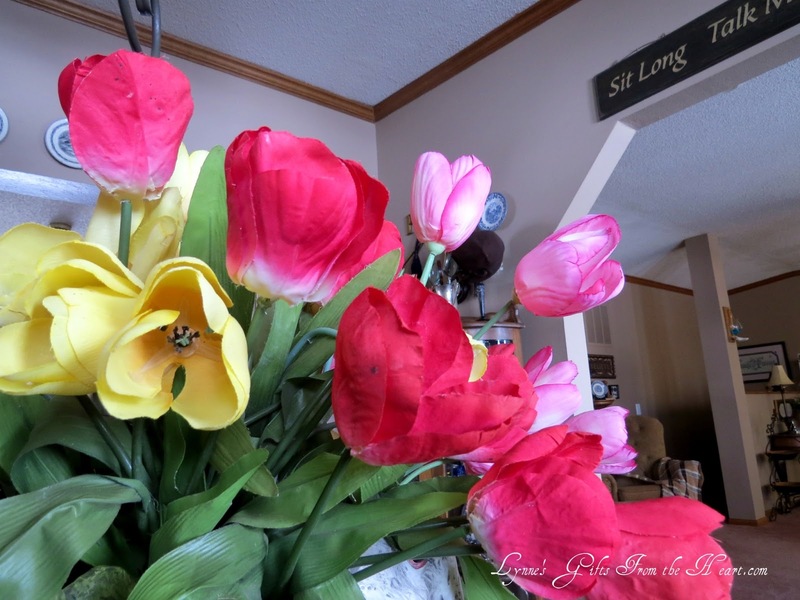 After leaving the pharmacy I made a bee line for the fresh flower section, I was on a mission for fresh tulips. Sadly, no fresh flowers, I would have stopped by the local florists, they weren't open either. :-( If a gal can't have fresh flowers she settles for faux flowers right? I don't recall sharing the bunny planter with you, today is his debut. lol When I spotted this cutie I knew he was meant to be mine. His bib overalls add character and charm to the cabbage he holds. His eyes seem to smile with the load of bright colored flowers. 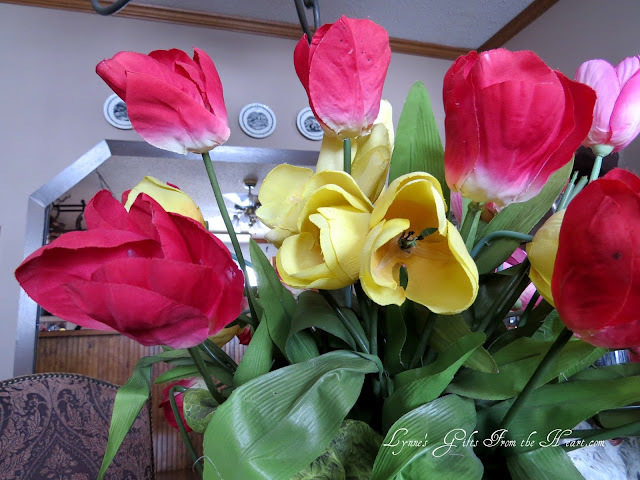 The centerpiece is a bright spot on the dining room table, so needed with all the white stuff we have outside on the ground. 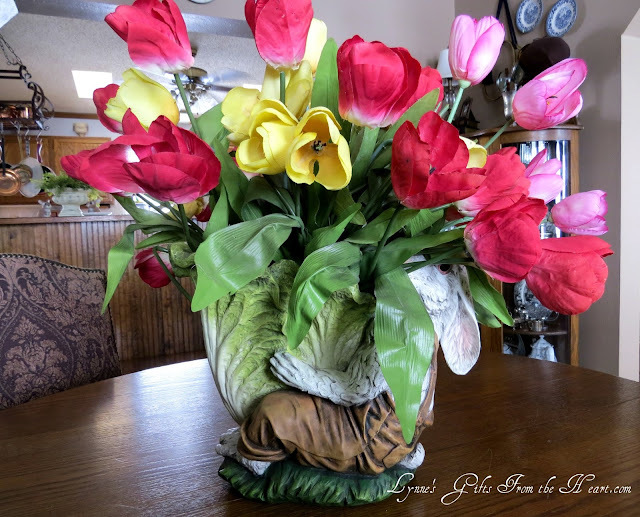 In closing I hope these brought a bright spot to your day, if you haven't started your Spring decorating, hopefully this sparks your heart to get started. 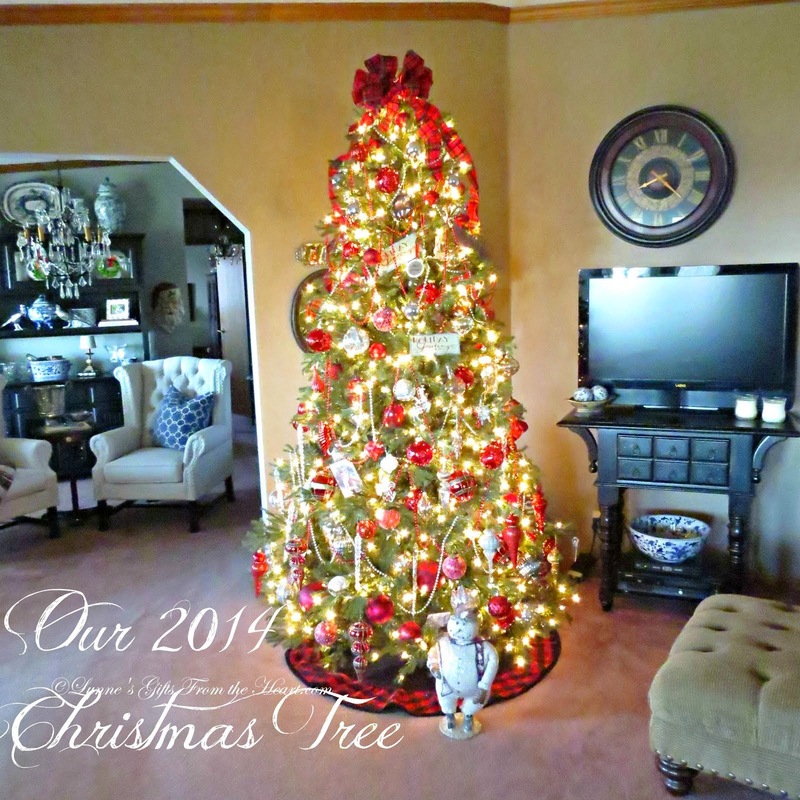 You don't have to go overboard in decorating every flat surface in sight, add a few touches here and there and enjoy. 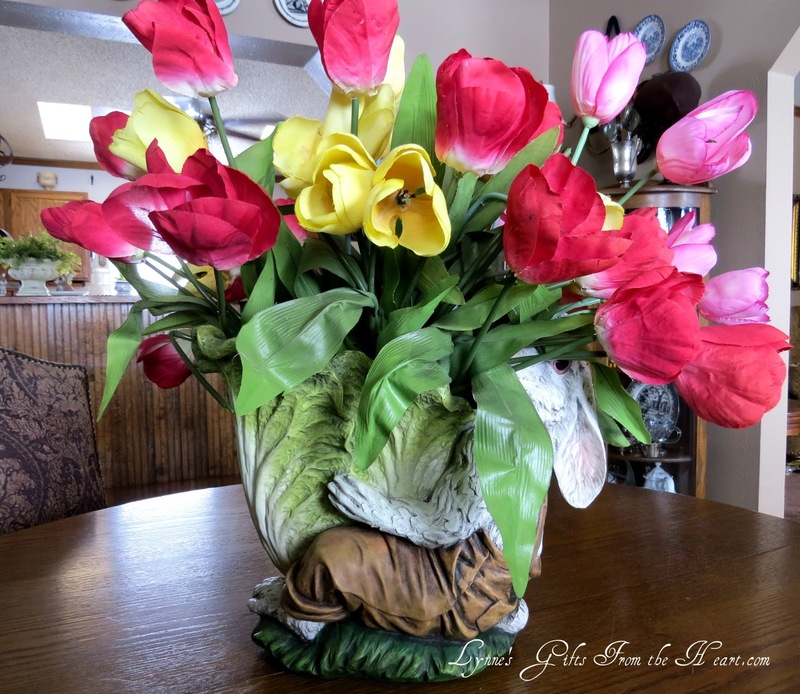 Lovely tulips and birdies! It always seems like I'm risking life and limb in the winter so the backyard birdies are fed! They're spoiled just like my dogs! What a picture with all the birds...that is amazing!! 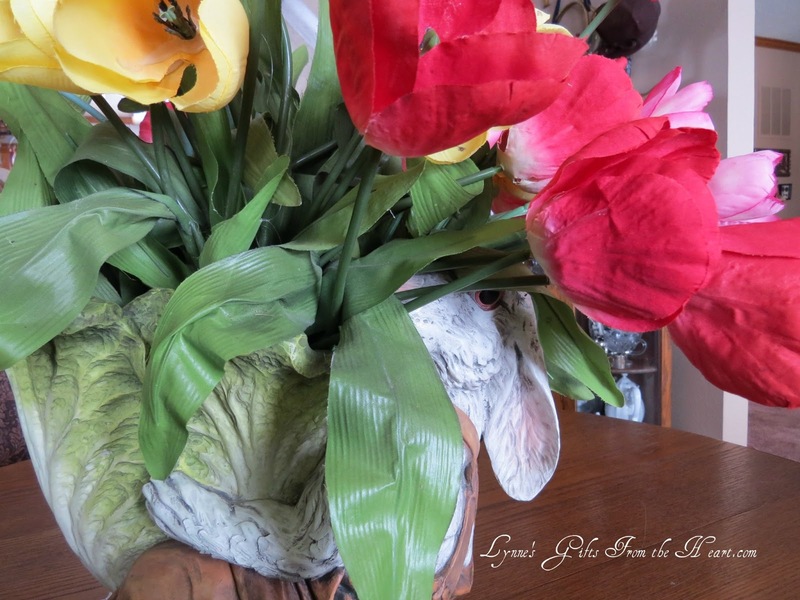 Cute vase...nothing wrong with faux flowers, they never need watering, never shed petals or leaves, either! Have a great weekend, Lynne. Lynne your tulips are very pretty!! That little bunny planter is just too cute! The faux tulips are very pretty ! Sleeting here now and light snow expected tonight. 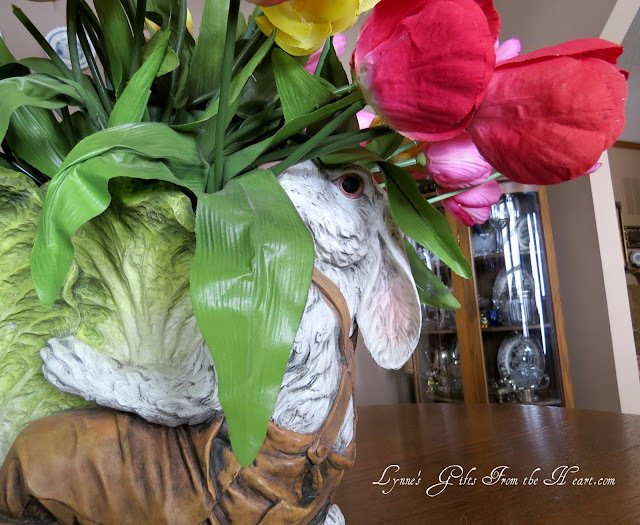 Your tulips are so pretty in that cute bunny planter. They did bring a bright spot to my day. :) Gosh, you have sooo much snow, but I'm sure the birds really appreciate your wading through all that to feed them. Have a great weekend, and stay warm. Those tulips are super cute... my cats like to eat real flowers, maybe I should try faux ones? The photo with the birds is beautiful... your sweet to feed them!